With a whopping 2.62 billion social media users around the globe in 2018, social media influence is undoubtedly something to contemplate upon. When in their spare time, nearly 2 billion people spend on scrolling social media platforms; the sole reason it being interactive and fun. Furthermore, as there is no shortage of any information in social media, it turned out to become a boon to the society. A social media strategy allows you to get noticed by your consumers over your competitors. Your brand becomes visible to the digital eyes making it easier for your customers to find and connect with you. Moreover, if you introspect, social media marketing is possibly the most cost-effective way. Create an account and sign up. It is almost free for major social networking platforms. An uptight online presence can make or break your brand. So, how could marketers miss the incredible opportunity of acquiring customers through social media? Marketers started finding out ways to channelize the personalized data to target potential audience on social media platforms. They already had a customer base which was managed by marketing technology software, but to entail more interaction social media came into the game. Social media engagements gave them the advantage of utilizing the two-way communication with their target audience so that they get to know their wishes, and can cater to their interest with ease. Also, you get to reach and target more people than you can do through other marketing channels. Maintaining the brand efficacy in the market needs to induce trust within consumers. Value addition is inevitable to build brand loyalty which persuades customers to share and subscribe. Conversion happens when there is a sense of trust. The trust factor consists of Quality, promotional activities and interaction with consumers. Quality prevails in this section, the quality of the product service or contents shapes a brand. In the long run quality with innovation is what marketers deal with. Through research of the existing elements must be carried out and action must be taken based upon the insights. Promoting content on social media contain everything about a brand itself. It is inevitable to provide quality information to keep the trust score flying high. 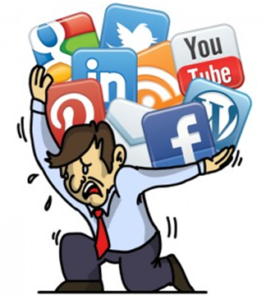 Rushing or pushing posts deviates brand personality. Customers are assets, interacting with consumers on social media platform makes the customer confident and thus aids brand loyalty. Answering queries in real time and providing support also engages customers on a real-time basis. Customers don’t feel alienated, and this opens up the vast possibility for marketers. But there came a dilemma as which platform to give more preference over the other. When planning to get your social media ideas right, you cannot choose one platform over the other. Combining all the platforms is the key to a successful social media campaign. Hence, social media management tools came into the picture. Social media management platforms started showing significant impact on brands garnering scalability and targeting the desired audience in an amicable channel. Although in the preliminary stages it lacked clarity, however with the involvement of artificial intelligence and robust algorithm, the processes became automated. Social media strategy handling tools allow you to schedule posts, check insights of your audience interaction and do many more. These tools have expertise in modifying their influence based on the mindset of the audiences in each of these platforms. Social media analytics tools provide valuable data and help in understanding which posts are doing well in your targeted niche. These data could include aspects such as the mood of your market, relevant issues that are trending, operational metrics for particular posts that you have used in the past and competitive analysis too. To leverage the benefits out of social media marketing, invest in the most useful tools. Here is the list of five best social media management tools which you can use. HootSuite makes it easy to add multiple accounts and manage posts and contents cross-platform. It is amicable to schedule posts and thus saving time for creative work. MeetEdgar re-posts the quality posts when in need. The system analyzes the best interactive posts and re-shares when in need automatically. It pulls a lot of traffic on the go. Buffer tracks the links and examines the contents which are getting the most hits. Same contents are allowed to be customized for various social media platforms and shares the best contents within a fixed time frame. “IFTT” stands for “If this then that” contains self-learning algorithms which automate the plan of action based conditional modules. Prompt and action mode allows marketers to manage individual tasks comprising of deletion of contents, updating apps, enabling contents on any social media platforms. TweetDeck is free and provides a multi-column user interface indoctrinating conversations, news and information based on the user’s interest. TweetDeck gives the opportunity to create great contents in real time. All social media management tools that are available today comprises the evolution of social media marketing and reputation management. Having a great social media marketing strategy is not everyone’s cup of tea. A brand which has good market penetration may become senile if not having an excellent social media reach. Few tactics sustain and can withstand the external pressure of creating a brand presence, whereas others do not. Further, there can be no perfect time to start building a social media marketing plan. If you think you can do it with your limited resources, without even utilizing social media management tools, then follow your heart. Later you might find that starting a new marketing strategy is not that tough; you only need to keep patience. An excellent social media strategy can help you to change the way you do business. Sreejani chose to spread her knowledge about content marketing through her writing skills. She serves as a Content Writer for Way2Target. Is well versed in strategizing content and her articles are known to ignite engagement amongst seasoned writers to everyday people. Believes in content being only a tree in the forest. Has a dash of tenacity and thus thinks audience multiplicity as a critical challenge to conquer.